12.5" RCOS @ ~f/9 (2880 mm fl) at 0.64 arcsec/pixel. Shown at 0.85 and 1.28 arcsec/pixel. 4/14/2015 to 5/20/2015 Chino Valley, AZ... with CCDAutoPilot5 & CCDSoft. AOL guided. eXcalibrator v4.36 for (g:r) color balancing, using 96 stars from the SDSS-DR9 database. North is to the bottom. Because of the available guide star, the image looks better upside-down. 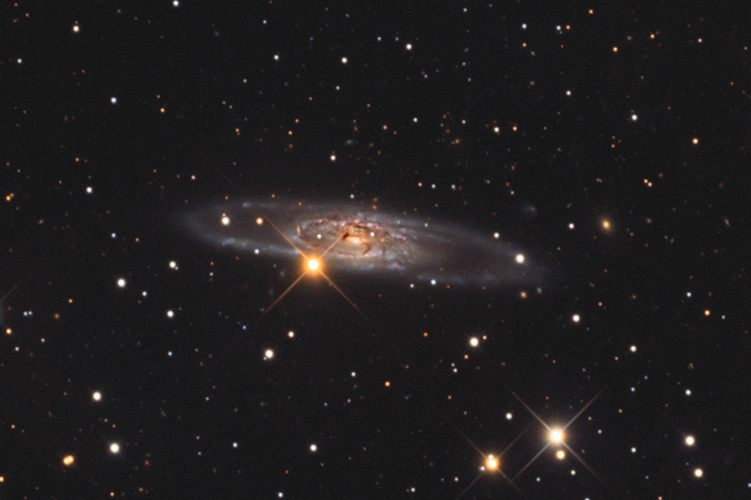 NGC 5792 is a a barred, ringed spiral galaxy about 94 million light-years away in the constellation Libra.